According to streetwise artist Word to Mother, “Blind By Stardom” is “a comment on the superficiality of society and how fame and celebrity status are the main objectives of today's youth”. A showcase of new paintings in mixed media on wood, mixed media assemblage and installation pieces, the exhibition is a heedful examination of how the constantly streaming spectacle of mass media invades our privacy and potentially manipulates our actions. 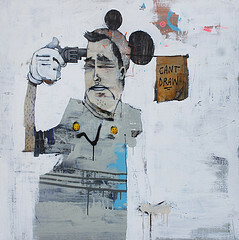 Supposing such violations as the personal acts of individuals (often in the guise of childhood icons such as Mickey Mouse and Spongebob Squarepants), the culprits and victims in his paintings are exposed as loathsome, pitiful and sometimes sinister through WTM's earthy style, toned down colours and use of found objects. His fourth solo exhibition at StolenSpace, “Blind by Stardom” brings with it a promise of even better executed and more provocative art to come. A limited edition zine with hand screen printed cover is available for sale during the exhibition. Thoughtful and engaging, “Blind by Stardom” runs until 24 October at StolenSpace, located at Dray Walk at the Old Truman Brewery, E1 6QL. The gallery is open Tuesday through Sunday 11am-7pm. Visit the Stolenspace website for details.